I remember vividly my first astronomy class in university. Winter 2004, only months before the Cassini spacecraft was set to arrive at Saturn after a seven year journey. On several occasions in that class we talked about what we might see when Cassini reached it’s destination. The first dedicated mission to the jewel of the solar system, originally conceived right after the voyager flyby in 1982, would give us a chance to study more than just a planet, but an entire system of interaction between a planet and it’s moons. Beyond that, it included the Huygens probe, to land at the enigmatic moon Titan, shrouded in a hazy atmosphere. What would we learn? How would we see Saturn after this mission? What secrets does a gas giant hold? -Saturn’s large moon Titan is covered in lakes of liquid methane, and has a liquid cycle, the only one found beyond Earth to date. For the public, the greatest reward is in the photographs, the views of a ringed world our ancestors could only dream of seeing. The entire catalog can be found here. 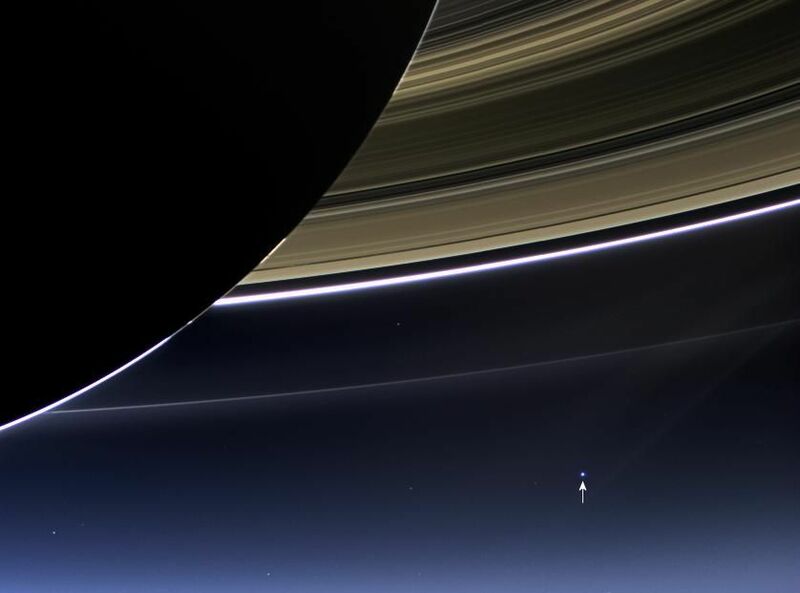 My favourite image of all is the newest rendition of the pale blue dot, looking at our tiny home world Earth as it peeks around Saturn. The grand finale of cassini ends with the craft becoming a part of the planet it has called home for more than a decade. To protect the pristine conditions of the untouched moons, the controlled dive of Cassini into the planet will give us a final stunning view before it burns up, ending a glorius era of scientific discovery. What comes next will depend on what the data teaches us of Saturn and it’s moons. A generation of questions raised from Voyager led us to Cassini, and the questions raised by Cassini will lead to dig deeper in our search for knowledge. Will we visit Enceladus to study it’s subsurface ocean? Will we dive into the methane lakes of Titan? Will we sample the hexagonal storms at Saturn’s poles? I look forward to continuing the search with the rest of humanity, but will always look back fondly on the golden years of Cassini. Tune in to NASA TV tomorrow morning, 7am Eastern time, to watch the live broadcast from Cassini mission control.